Rex Hill was the dream of Paul Hart and his wife Jan Jacobsen. Both were lovers of French burgundies and great fans of Oregon wines. Their goal was to buy the best vineyard land and grow and source the highest quality Willamette Valley grapes. In 1981 Hart sold his insurance actuary business and in 1982 purchased a 20-acre parcel in Newberg, long known as “Rex Hill”. The property was the former site of an old prune and nut drying business. The old prune dryer and other buildings were rebuilt by master builder Ken Haggard, keeping much of the original character. Some custmers commented that “touches of class” abounded. Rex Hills’ first winemaker was David R. Wirtz, a well kown and experienced vineyard owner and winemaking consultant. In the late 1970’s Wirtz was the cellarmaster for Charles Coury and winemaker for Reuter’s Hill Vineyards before both went out of business. 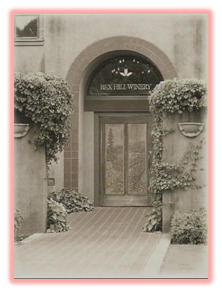 Rex Hill became known for selling well aged, vineyard designated Pinot Noir. From the beginning its business plan called for doing things a little differently then other wineries at the time. Grapes were purchased from a number of different vineyards, fermented and bottled separately, and sold as vineyard designated wines. Common today but not so in the 1980’s. First vintages were from the Archibald, Maresh, Dundee Hills, and Medici vineyards. Back in the 1980’s the question was asked “Is any Oregon wine worth $20/bottle? when no Oregon wine was selling for over $15. Paul Hart claimed Rex Hill’s 1983 Maresh Vineyards Pinot Noir was worth it as it was an excellent wine. He apparently was right as the wine sold well! In November 2006, Rex Hill Vineyards was sold to A to Z Wineworks, who continue to make premium wines under the Rex Hill name. 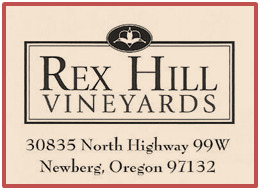 Rex Hill was located at 30835 N. Highway 99W, Newberg, OR 97132, and now home to A to Z/Rex Hill.